Recap: Injured AT end of March playing squash, didn’t see a doc until end of April, diagnosed ATR. Put in a walking boot. Around May 23 “weaned” off boot and into 2 shoes. Can walk almost normally without pain. Dorsiflexion is very improved but calf is still very weak cannot even start to do a heel lift on injured foot. PT has consisted of rubber band exercises pushing foot forward, backward and side to side with band around ball of foot. Light stretching, standing on one foot and stationary bike. My case is a little different from most due to my ignorance mostly, in that I was walking around on a complete ATR for over a month before I got any treatment. At that point surgery was not an option. 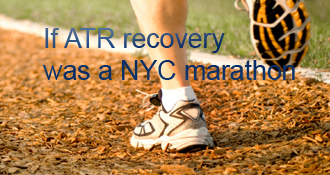 Had I known right away that I had an ATR I may have had the surgery. But it may have been for the best that I didn’t because according to the Doc I am recovering quite well as is and many new studies show similar outcomes between op and non op. The only suggestion from my own experience I can make which may even contradict Doctor’s orders is to start to exercise the lower leg as soon as possible within pain tolerance limits. Muscles atrophy very quickly when not used and it seems to me that half the recovery of an ATR beyond the repair is simply regaining muscle strength and RoM . So the less the muscle atrophies to begin with the less work you have to do to recover. Unusual case: ATR on 3/26/15. Did not receive medical attention until 4/29/15. Hi everyone. Here is my story: On Mar. 26 I was playing Squash. Last point of the game. I stretched to get the ball, not very hard, and bam. It felt like I had been struck by a bolt of electricity in my ankle. I immediately stopped playing and put ice on the ankle. I thought it was a severe sprain, it didn’t occur to me that it could be a ruptured achilles. I walked back to my car, and drove home. BTW my car is a manual transmission with a stiff clutch.! Long story short I didn’t get any medical attention for over a month. I was still thinking it was a severe sprain and would get better on its own as other injuries always have. I was walking on it (with a limp), driving my car, doing everything I usually do. The main reason I did not think it was ruptured was because I could do all this stuff and I had heard with a rupture you can’t even stand up much less walk. After a month it had gotten slightly better but not much. So I go to see the Orthopedic. Does an MRI and it shows a complete rupture! They couldn’t believe I had been walking around with an ATR all this time. They put me on an air boot, but said I could take it off for sleeping and bathing. The first Doc I saw said he wouldn’t operate because too much time had passed. The second Doc I saw said no problem to operate. The third Doc did not recommend operating. So 2 out 3 said no and my own reading on this website and others convinced me that nowadays most Doctors think the outcomes are very similar with op and non op. Another thing that everyone who saw me noted was that I have very good mobility in my foot. I am at about week 6-7 and am in rehab. I can do all the exercises and have no pain what so ever. They think that the tendon has started to form scar tissue. So that’s my story. I think that the fact that I was walking around with an ATR for a month may have actually helped me but we will see how the rehab goes. .
Wow, you must REALLY do not like going to see the doctor, even for pain meds! This is a very interesting story and I look forward to following your progress. The fact that you walked on that foot for a month with no cast is amazing and that you weaned off the boot at 8 weeks is a testament to the body’s ability to heal on its own with minimal intervention. The literature suggests the end result will be the same, the only issue I’ve found is your higher chance of re-rupture. Stay safe and keep healing! chafu’s AchillesBlog is proudly powered by WordPress and WPDesigner..